We created The Warbler to offer a harder, more effective roller that doesn’t add clutter, but rather acts as a beautiful addition to any home or workout room. Today, 42 Birds launches its campaign for The Warbler, a massage roller made of cork, one of the most sustainable materials on the planet, that is an all natural, aesthetically pleasing alternative to foam rollers. The Warbler helps with self-myofascial release (SMR), which is listed as one of the top fitness trends by the American College of Sports Medicine. SMR works to correct muscle imbalances, improve joint range of motion, relieve muscle soreness and joint stress, improve blood circulation, relax muscles and help lengthen muscles and break up adhesion and scar tissue. The Warbler can also be used as a prop in yoga or workout practices. “We created The Warbler to offer a harder, more effective roller that doesn’t add clutter, but rather acts as a beautiful addition to any home or workout room,” said 42 Birds co-founder Addie Conner. “We care deeply about the environment and wanted to build a company that led by example in creating products that offered top performance while using the most sustainable materials available,” said 42 Birds co-founder Robyn Shapiro. Cork has natural antibacterial, antiallergenic and antistatic properties, giving it the ability to self-clean and making it the healthiest material to use against the body. While foam rollers contain harmful chemicals that are not great for skin or the planet, cork is an all-natural, completely biodegradable material. Cork is antimicrobial with 98.6% of bacteria killed within 90 minutes of impact. When the body releases toxins and sweat it is great to know that the roller will not be storing them, unlike other rollers made of different materials. 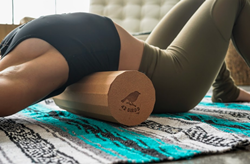 The Warbler cork massage roller has special, subtle ridges that connect with the contours of the body to hit all of the right trigger points to loosen knots and restore soft tissues and muscles back to their original form. Similar to a deep tissue massage, the high density, firm cork material helps apply the perfect amount of pressure on stiff muscles to help aid in releasing tension, providing long-term solutions, unlike softer rollers that only aid in the short-term. Most foam rollers are unattractive and bulky, but the 18” by 5” Warbler is aesthetically pleasing and can even double as a purposeful piece of furniture. The Warbler is currently available on Kickstarter for $39, which is over 45% off of the future retail price. For more information or to pre-order, visit pr.go2.fund/thewarbler. 42 Birds family of eco design-driven yoga products includes cork yoga mats, cork blocks, cork massage ball set and now a cork roller. The all natural cork yoga mat and blocks provide a superior grip for both hot and traditional yoga, and as cork is antimicrobial, the products are self-cleaning. The cork roller and massage ball set is great to assist with self-myofascial release (SMR), an alternative medicine therapy. Whereas most yoga products are unattractive and made from potentially harmful chemicals, all 42 Birds products blend natural sustainable cork in a line of beautifully designed products. For more information, visit http://www.42birds.com.